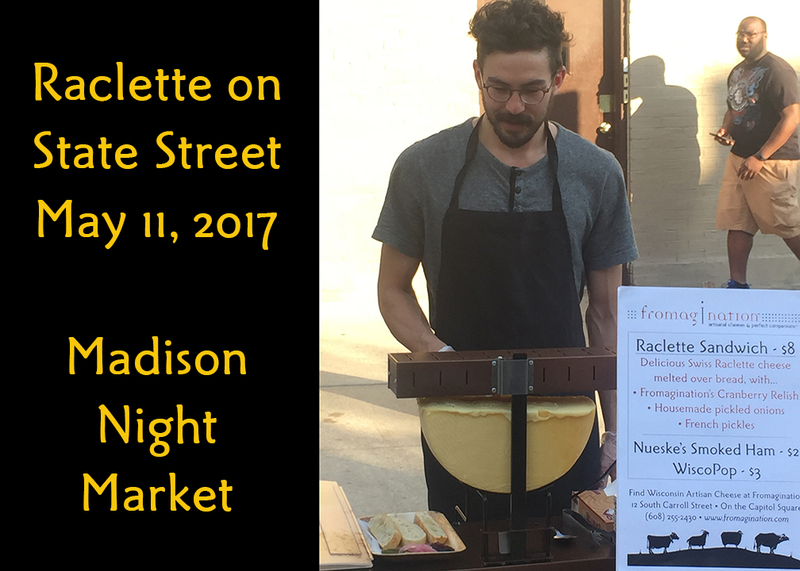 The May 11 Madison Night Market featured Fromagination’s raclette machines melting the Alpine cheese for hungry market attendees…until we sold out. Well before 11:00 p.m, unfortunately. The Night Market, kicked by Madison Mayor Paul Soglin, is a new feature for the downtown events calendar this summer. And the food at the first Night Market was plentiful and varied. We’ll follow that up Thursday, June 8, with the second Night Market. Look for the Fromagination table near State and Gilman streets to get your Alpine cheese on! This entry was posted by Kyle Richmond in Fromagination Calendar.